Leicester arrived early and carried that momentum into the first half here, racing into a 2-goal lead thanks to a penalty and a fine finish from Nat Johnson. Lewes ‘keeper Faye Baker was adjudged to have fouledFreda Ayisi as she challenged with her feet. Baker guessed right but could not stop Johnson’s fine spot-kick. Hers and City’s second came when a Lewes back-pass fell short, allowing Johnson to steal in to slot home unopposed. 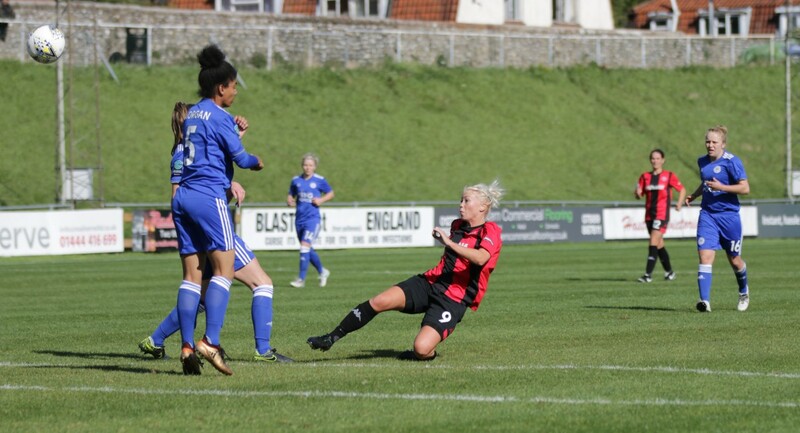 Lewes, who came from behind mid-week v Crystal Palace, responded, Rebecca Carter finding the net just after the half-hour with a well-judged lob over Demi Lambourne from just inside the box. HT 1-2. Lewes started the second half well. Baker, injured in the first half, made way for Nina Wilson. The game settled into a tight contest, both sides struggling to create clear chances. Lambourne made a fine save from Leeta Rutherford’s powerful header. McCue picked up the game’s first booking just after the hour for a late challenge on Dani Lane. Lane rose well to meet McIntyre’s flighted free-kick, Lambourne punching clear. Wilson made a good stop from a Maddie Cusak overhead kick before Lewes levelled the scores on 71 minutes. Carter once more, finishing off a superb, cushioned pass from Sarah Kempson by slotting the ball under Lambourne. Four minutes later Carter completed her hat-trick andLewes had the lead, Dani Lane the provider. Samantha Quayle replaced Lane with ten to go and finished the move of the match to make it 4-2. Kempson shaped to pass right, switched to her left to send in a clever ball for Avilla Bergin who beat her full-back and picked out Quayle at the back post with an inch-perfect pass. 4-2. “We’ve had three poor results so we’re looking to bounce back in that one. I think the results so far have shown anyone can beat anyone in this league. It’s about who turns up on the day"